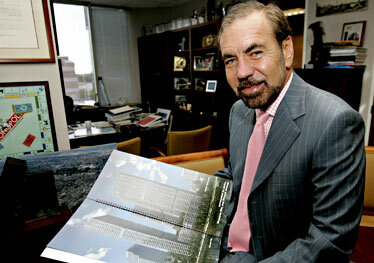 He started out as the leading builder of affordable housing in Florida, but over the past 26 years, developer Jorge Perez has become the Donald Trump of the tropics, with about 50 condo towers in various stages of completion in South Florida, Fort Myers and Las Vegas. His company, the Related Group of Florida, had $2.1 billion in revenue in 2004, putting Perez at the very top of the Hispanic Business 500. Some of his luxurious condos command as much as $15 million a unit, and his Vegas project is a five-star hotel and casino complex, modeled after Barcelona's famed Las Ramblas. But Perez says his primary mission is to revitalize downtown Miami, which offers little in the way of a residential community, and make it a cultural and business center for the Americas. "I see it as a great international city for traders and people who are always looking for business and possibilities in other countries  sort of like the Phoenicia of old, where everybody came together to do business and cultures merged," he says. Perez, 55, who was born in Argentina of Cuban parents and came to the U.S. in 1968, is as passionate about politics and the arts as he is about building. An active Democratic fund raiser, he advised Bill Clinton on Cuba. His art collection includes work by such Latin American masters as Fernando Botero, Frida Kahlo and Roberto Matta, among others, and he avidly promotes art in public places. Everything Perez does reflects his philosophy that "Every time you make an act, not only are you defining yourself, but you're defining the world around you." The Miami skyline shows he's doing just that.